Last week I examined how much better Ivy League grads have it on Wall Street compared to non-Ivy Leaguers. 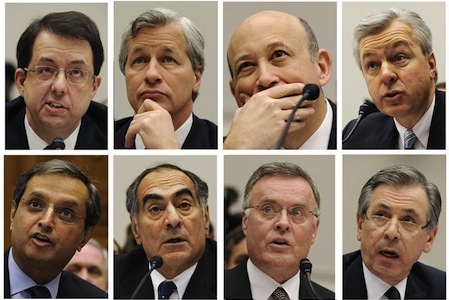 This week I turn to women vs. men—specifically to women and men at the two most prestigious investment banks on the planet: Goldman Sachs and Morgan Stanley. 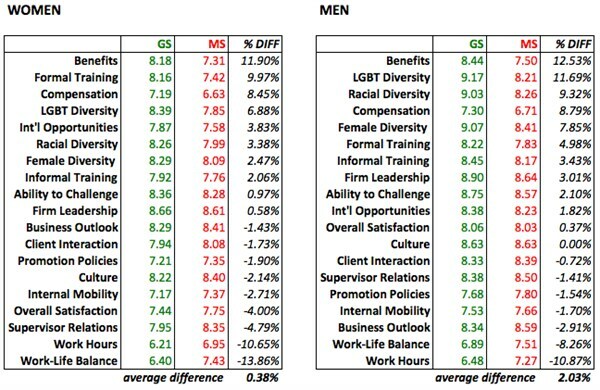 I was curious to see, parsing our latest Banking Survey data, the difference between how men and women at GS and MS rate their respective firms in various workplace categories. I admit that I expected men (since they make up a majority of professional positions on Wall Street; if our latest Banking Survey is any indication, it's about 70/30 men to women on the Street) would likely give their firms better ratings than women. However, I didn’t expect the numbers to fall so far in men's favor. If you believe that numbers don't lie, it's clear that Wall Street women are getting a TON less satisfaction than Wall Street men. As you'll see in the below tables, Goldman Sachs and Morgan Stanley men rated their respective firms higher in every major workplace category in our latest Banking Survey than their female colleagues. 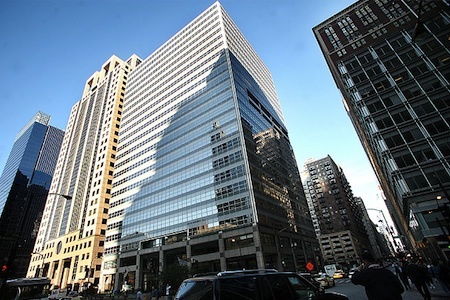 In fact, the average difference in scores between men and women at Goldman was more than 5% and at Morgan Stanley it was nearly 4%. (Note: more than 3,600 banking professionals took our survey earlier this year, including about 2,500 men, 1,100 women, and a few hundred each from Goldman and Morgan Stanley). Perhaps even more interesting than the overall disparity are the various categories where scores varied most. At Goldman, there was great disparity between men's and women's scores when it came to diversity. Men rated Goldman more than 9% better in all three major diversity categories: female, racial, and LGBT diversity. This sends a strong signal that men and women are seeing diversity recruiting and retaining through very different lenses. There was also quite a disparity in overall satisfaction, with men scoring satisfaction more than 8% better than women. And work-life balance wasn't far behind. 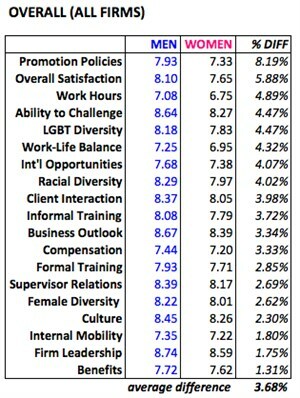 Men's scores were more than 7% better than women's in this category, signaling that life at Goldman is much kinder if you're a man. To that end, Goldman women told us in our Banking Survey this year that work-life balance is "poor" at worst and "challenging to achieve" at best. "There's an expectation of rapid response time to emails at all hours on all days," one female banker at Goldman told us, "and it's difficult to find a substitute for vacations." According to another woman, "Goldman really tries to have many options to create work-life balance, but the culture in and of itself just doesn't really promote it. All my coworkers are working just as hard as I am and, because of that, it feels like there's less opportunity to have work-life balance." Yet another woman at Goldman told us, "We're constantly encouraged to balance work and life, while in reality it is almost impossible to balance them if you're given a lot of work late in the evening. If your managers are working long hours and aren't involved in activities outside of work, then it might be challenging to convey why balance and outside non-work initiatives are so important and essential to you." However, men and women do seem to be paid nearly equally at Goldman. Men rated their satisfaction with respect to comp only about 1.5% better than women and their satisfaction with benefits just 3% better. Meanwhile, at Morgan Stanley, women and men rate their work-life balance, compensation, and benefits very similarly. However, areas with great disparity include international opportunities (men rate MS 8.58% better in this category than women), promotion opportunities (men rate it 6.12% better), formal training (5.53% better), and informal training and mentoring (5.28% better). This perhaps points to the difficulty women face when trying to rise the ranks at Morgan Stanley (and at other Wall Street firms) and underlines what so many female (and male) bankers have told us in recent years: although women are being better represented at the entry levels on Wall Street, there are still very few women in senior positions. How Goldman and Morgan Stanley compare to the rest of the Street can be seen below. In this table, I included ratings from men and women at every firm (that is, every firm that participated in our survey). 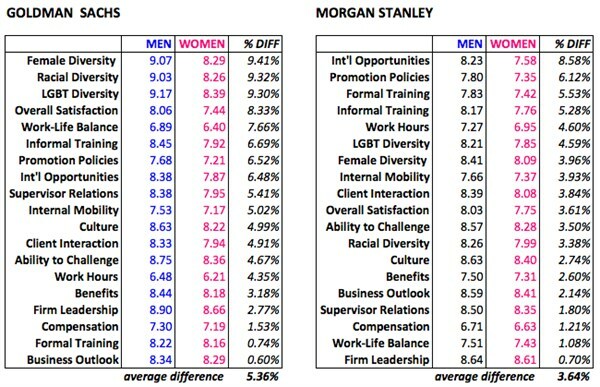 You'll see that the average difference between men's and women's scores is more in line with Morgan Stanley's results than Goldman's. Also interesting is that promotion opportunities has far and away the most disparity, with men giving their firms more than 8 percent higher ratings in the category. Overall satisfaction is also rated much better by men (nearly 6 percent better). Going back to Goldman and Morgan Stanley, and looking more closely at how these firms fare head-to-head, see the below two tables. You'll see that the table on the left compares Goldman with Morgan Stanley with respect to women's ratings, and the table on the right compares men's ratings at the two firms. As in the above tables, I've ordered workplace categories from most to least disparity between scores. You'll see that, on average, taking all the workplace categories into account, Goldman Sachs is rated slightly higher than Morgan Stanley. However, in some very important categories, such as work-life balance and work hours, Morgan Stanley is rated much better than Goldman. What the data shows is that, no matter if you're a man or a woman, if benefits, compensation, and training are most important to you (and you have the fortune of choosing between GS and MS), Goldman is the way to go. But if work hours and work-life balance are most important, Morgan Stanley appears to be the obvious choice.